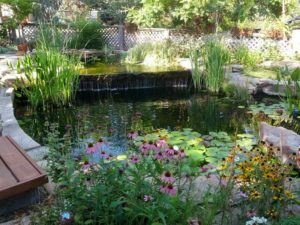 So you know you have a leaky pond… what now? We were very fortunate that the leak started slowly. The slow leak development has given us time to plan as well as breathing room to make sure we’re making the right decisions. When we realized that we were looking at a major remodel, we starting to think about what we would do differently. The giant bog filter worked well, but it was now 15 years old and suffered from channeling. We were able to clean it up a bit using MicrobeLift Sludge Remover, but the result was modest at best. Molly wanted a more traditional pond filtration system but I was thinking about rebuilding the bog, though in a more maintainable configuration. The year before, a former IWGKS member gave Molly and Sue Boydstun an opportunity to salvage some old equipment. This included an old Ultima II 20000 filter. Boy was I surprised to see that in the back of the truck when I got home from work that evening. The filter was the factor that pushed me over to my wife’s way of thinking, and the bog was out. I refurbished the filter in spring 2017 by adding a new valve assembly (ordered from Aqua Ultraviolet), repairing the jets (by mending the molding seams), and cleaning out the old media. The filter became the cornerstone of our filtration system. Ultima IIs have some known drawbacks, like easily clogged media, but for us a $500 refurbish job beats a new $3000-$4000 filter. There are documented ways to improve the operation of the Ultima II: using compressed air for cleaning and ensuring adequate water flow through the filter. 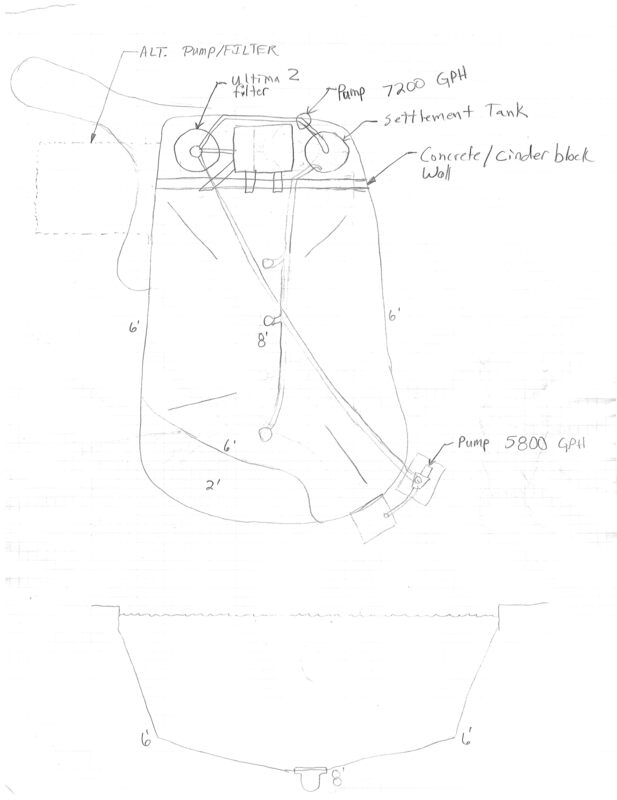 With the filter in good shape, I dove into the filtration system design. I did a lot of reading about PVC pipe diameter, friction loss, head loss, water speed, solids settling, etc. I’m still learning new stuff every time I get into research mode. I was a planning on getting a fine art degree in college and I have felt (only a few times) that I should have gone into mechanical engineering. At some point, I felt comfortable enough to try to get my ideas out on paper and drew up a first draft concept of how the system would work. 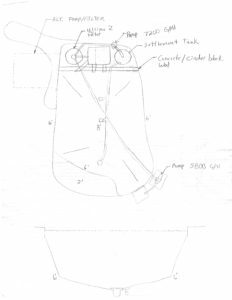 Any experienced pond engineer will tell you this design isn’t great, but you have to start somewhere. I believe this is an important step for any project because it allows you to coalesce the swirling bits and pieces of information and theory into something you can visualize and refine. 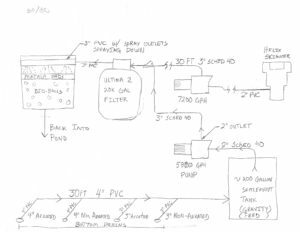 With a plan on paper, I started to figure out how to position the new pond and its equipment within the current footprint of our pond. The obvious place to put the equipment was in the bog garden. Because the pond will be one giant hole, we need a structure to separate the equipment, such as a concrete or block wall. The liner will extend over the part of the wall forming one end of the pond to keep the equipment area dry. This was the first iteration with everything roughly laid out. 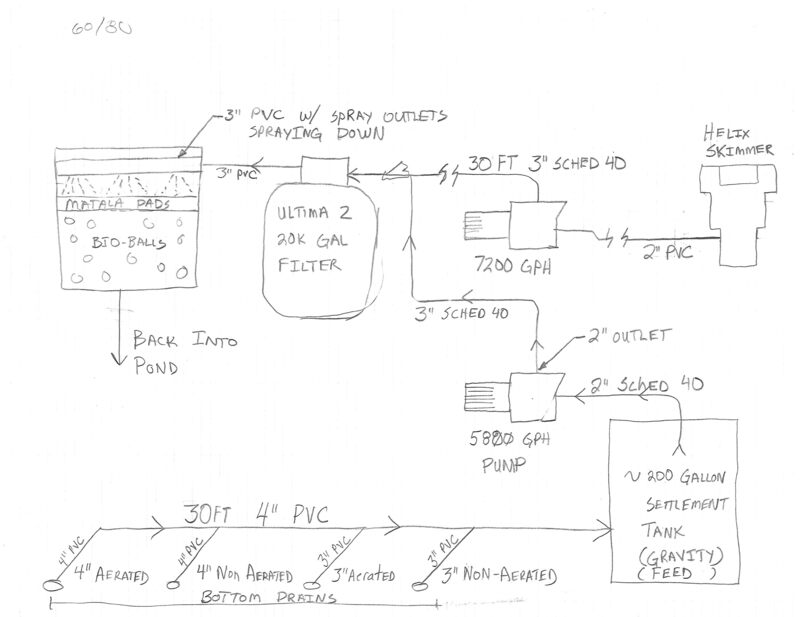 There are some obvious design flaws (each bottom drain needs its own pipe), but it’s only draft #1. As the project has progressed I have able been tap into some extensive knowledge from local IWGKS members. While the details of the design have changed, the overall plan is still fairly similar to these original drawings. The neighbor’s cat is wondering what is going on…. The 2018 Pond Remodel is Happening! We bought our house in 2010 knowing it was going to need work. The pond, however, was one big the selling points. The pond was installed by the previous homeowner who claimed to have worked as a landscaper. For six years, unlike the other work the previous owner did on the house, the pond ran well and we only had a few minor issues with it. As you can see, the pond was a two-level layout. The upper level was a bog garden, the only source of filtration. The lower level was five feet deep under the waterfall and gradually declined to six feet deep below the skimmer. There are no bottom drains and the bottom of the pond is covered with three quarters to one inch-sized gravel. We estimate the volume was about 11,000 to 13,000 gallons. Two years ago (early 2016) we noticed the pond needed topping off far more often than previous years. In late 2016, we were losing one to two inches of water a day and we began planning a remodel for early 2017. Unfortunately, the contractor we started to work with moved on to another project around the time we were planning on starting and we scrambled to find a landscaper. In the meantime the leak in the pond had progressed to losing four inches of water a day and we moved the fish into an above-ground swimming pool. The fish seem to be fine in the pool, waiting for their new pond. Fast forward to 2018 and we have found a reputable landscaper named Urban Escapes and are working on the final touches to the planned remodel. 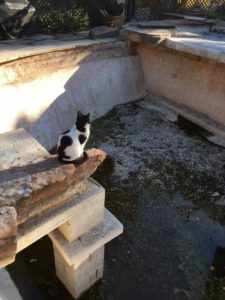 We’re now about a month away from the start of the pond remodel and will try to share as much of the process as we can, and some of what we have learned as well.